I’ve noticed some people have been comparing the coalition’s workfare ideas – where the unemployed have to work for free or have their benefits taken away from them – to the ideas behind the infamous Victorian workhouses. I’m no historian, but I’ve been perusing some interesting articles about the origins of the workhouses and it may actually not be such an exaggeration after all. The workhouses, made famous by Charles Dickens in Oliver Twist, were the result of an act of parliament in 1834 called the Poor Law Amendment Act. And I’ve discovered something interesting. 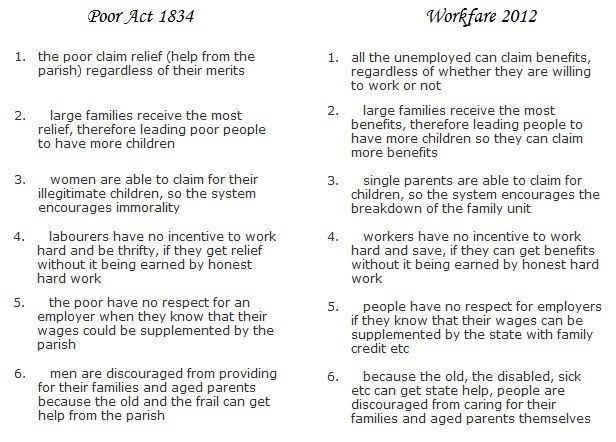 The reasons why Victorian politicians deemed it necessary to put the poor and the vulnerable in workhouses, are worryingly similar to the justification the government gives for modern workfare today. So the truth is – we’re not seeing a return to the bad old days of the 1980s under Thatcher as some people think. What we’re really seeing, is a return to the bad old days of the 1830s under the Victorians. Are there no prisons? And the Union workhouses? Are they still in operation? This entry was posted in Employment, Topical News and tagged Conservatives, employment, unemployment, welfare reform by Tom Pride. Bookmark the permalink. Another parallel between the Victorian attitude towards the poor and the attitude of right-wingers today is a distinction which they both drew between “deserving” and “undeserving” poor. The idea that they, the Victorians – or the contemporary “honest hard-working [Daily Mail reading] citizen, belong on the right-side of a distinction which views as inferior in morals those they would deem to be “beneath” them. It is an arrogance borne of self-righteousness, as nauseating, myopic and uncharitable as it is dangerous. I see it frequently in north European societies – particularly in Germany and Holland at the moment. It explains, I believe, in large part the behaviour of the Merkel govenrment towards Greece, in its vindictiveness and lack of compassion. The paralells many Greeks are drawing between Nazism and current German government behaviour are not merely, I would contend, the result of traditional historical animosities on account of WW2, but more the result of taking offence at a deeply offensive attitude towards by them by Germany, concomittant with a ruinious and vindictive economic policy being imposed on them by them by the EU-ECB-IMF “troika” – backed largely by German money and gunboat diplomacy. Stephen – and a very good comment. What an excellent article. I have spouted for some considerable time that we are heading back to Victorian poverty with the “deserving poor” and the “undeserving poor” with charities doing their best to cope with the army in both those camps. The march of corporatism and the plundering of all public assets is taking us to a society where we will be completely dependent on the business world for everything, no social structures, just work and pay for it, or do without, or perhaps appeal to some charity if you are lucky. As this unfolds at an alarming rate I begin to question whether the human is a social creature or not.